These jumbo lump crab cakes use a mixture of shrimp, cream and egg to hold them together – no fillers. The only way to make them better is pair them with perfect summer tomatoes. They also make great little sliders served on brioche rolls. Combine all the ingredients in a jar with a lid and shake to combine. This will make more than you will need for this recipe, keep the remaining dressing in the refrigerator. In a food processor add the shrimp, egg, cream, zest and chives and pulse until almost smooth. Place the mixture in a medium mixing bowl. Add the crab and gently fold the mixture together, being careful not to break up the lump crab. Heat a large sauce pan to medium high heat and add a few tablespoons of butter. 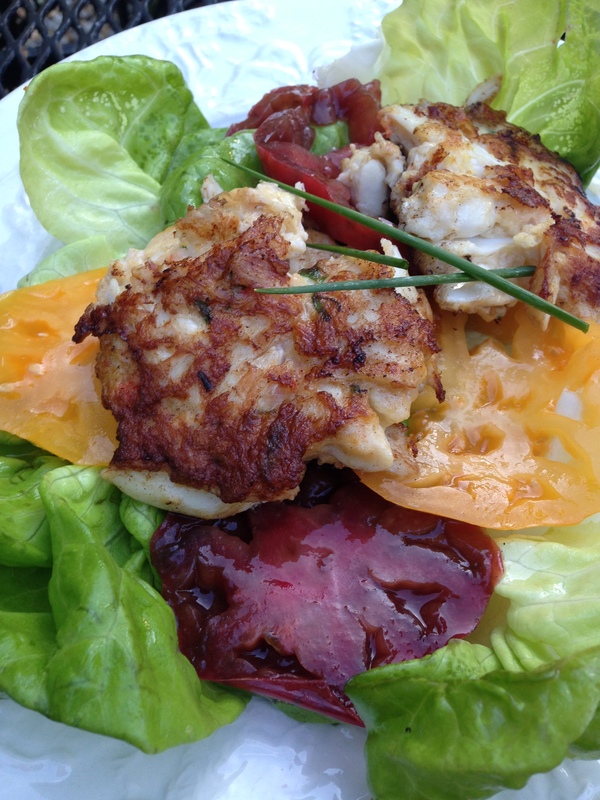 This entry was posted in Recipes and tagged lump crab, salad, Salad Dressing, Shrimp, Tomaotes. Bookmark the permalink. Wonderful! They are a bit of a splurge – but worth it!